Register by May 10 to take advantage of our early bird rate of $50 per person. After May 10, the rate will go up to $65 per person. All proceeds will benefit the Florida Public Relations Education Foundation. If paying by credit card, we've included an option below to cover your card fees, ensuring that 100% of your ticket costs supports the FPREF. If you'd like to pay by check, please use the Special Offer Code FPREF2019 at checkout to deduct the cost of your ticket(s) from your order. Then mail a check for the cost of your ticket(s) made out to the Florida Public Relations Education Foundation to the FPRA State Office at 40 Sarasota Center Blvd. Suite 107, Sarasota, FL 34240. On Monday, August 5 from 6 to 9 p.m., FPRA conference attendees and their guests are invited to board the Yacht Starship for a private sunset cruise. FPRA's private charter, with its award-winning cuisine and service, will offer guests a fabulous networking experience while cruising Tampa Bay. 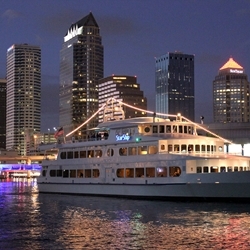 Your sunset cruise experience will be a great way to unwind after a jam-packed day of professional development. Guests will board the Yacht StarShip outside the Tampa Marriott Waterside Hotel & Marina, the host property for FPRA's 81st Annual Conference. A fabulous buffet dinner is included as well as great music for dancing. This event is NOT included in your full conference registration. Would you like 100% of your ticket cost to support the FPREF? If so, please consider covering the cost of your credit card fees. Yes, I'll pay my credit card fee of $1.43 per ticket. No, charge me $50 per ticket.